As an Australian, I like to keep a list of touring bikes that are currently available in our stores. Unfortunately we have a pretty slim range compared to North America / Europe / the UK – but you should be able to find something you like! The Allegro T1 is made by an Melbourne-based company with a passion for environmentalism and fair work. 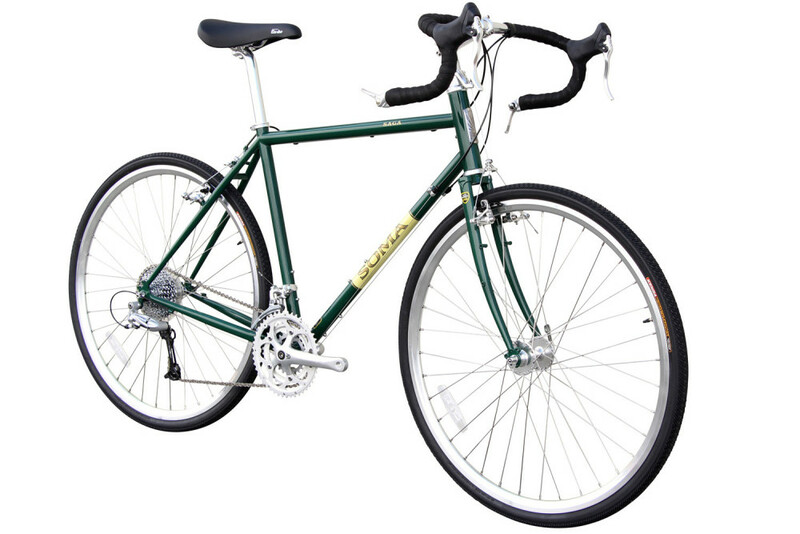 It is constructed using steel tubing and features v-brakes, bar-end shifters, a rear rack and fenders. I generally find that double cranksets like the one featured on this bike do not achieve a small enough gear for steep climbs (especially with heavy panniers). You may want to look at this resource for ways to achieve smaller gear ratios HERE. Best suited to: Loaded touring on-road. This Fuji is the best value touring bike in Australia. 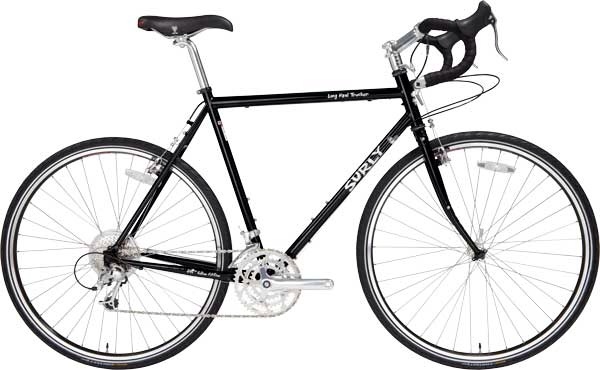 It employs a steel frame/fork, bar-end shifters and 36 spoke wheels to keep it simple. 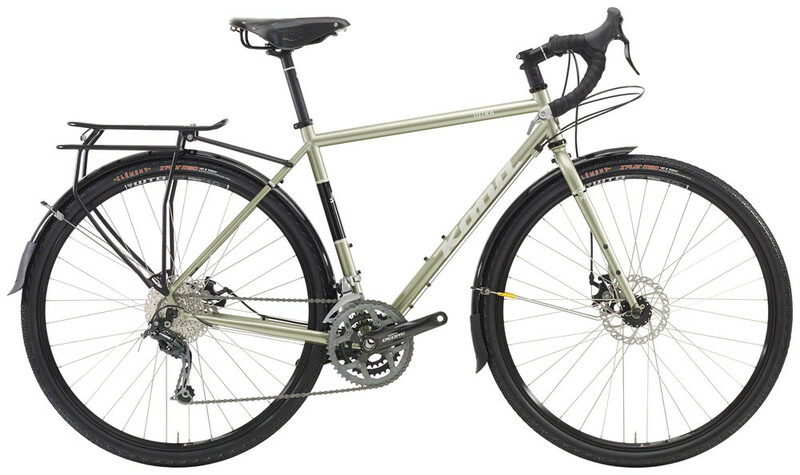 This touring bike comes with a good climbing gear too (26-34t / 21 gear inches). 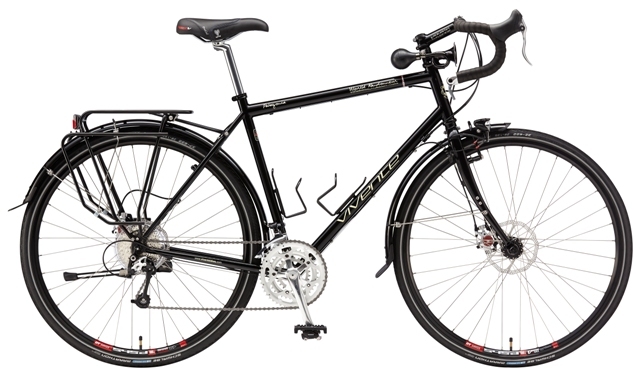 You can read more about the Fuji Touring in my resource HERE. Best suited to: Loaded touring. The Kona Sutra has been improving year on year for almost a decade. This steel frame and fork is setup with a great geometry, the gear ratios are wide (22-119 gear inches), there’s barend shifters and it even comes with a Brooks B17 saddle! Best suited to: Loaded touring, on or off-road. Best suited to: Off-road travel. 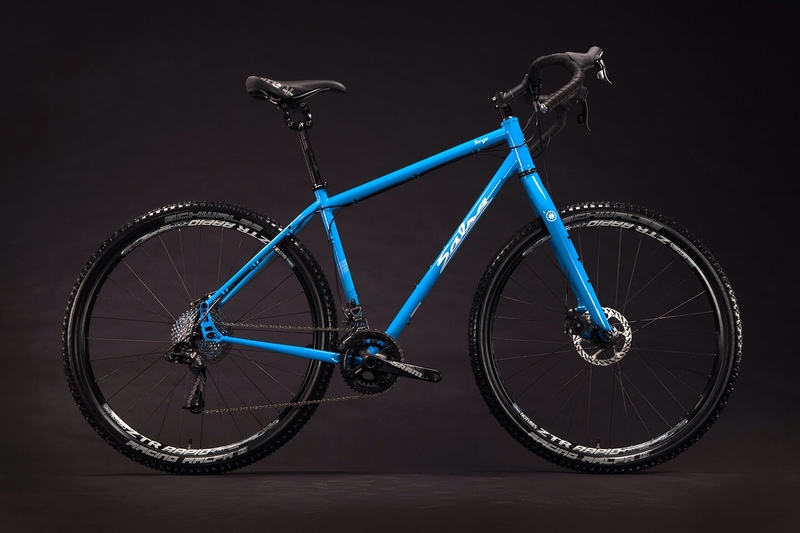 Pros: Mountain-bike geometry to take it properly offroad, steel frame/fork, wheels, thudbuster post, tyre clearance, bidon cage mounts everywhere. Cons: Bike geometry not the best on-road, STI shifters can be problematic on remote tours, crankset doesn’t offer many bigger gears. Pros: Steel frame/fork, Sram gearing, wheels. Cons: Road double crankset does not achieve small enough gear for steep climbs with gear, STI shifters can be problematic on remote tours. 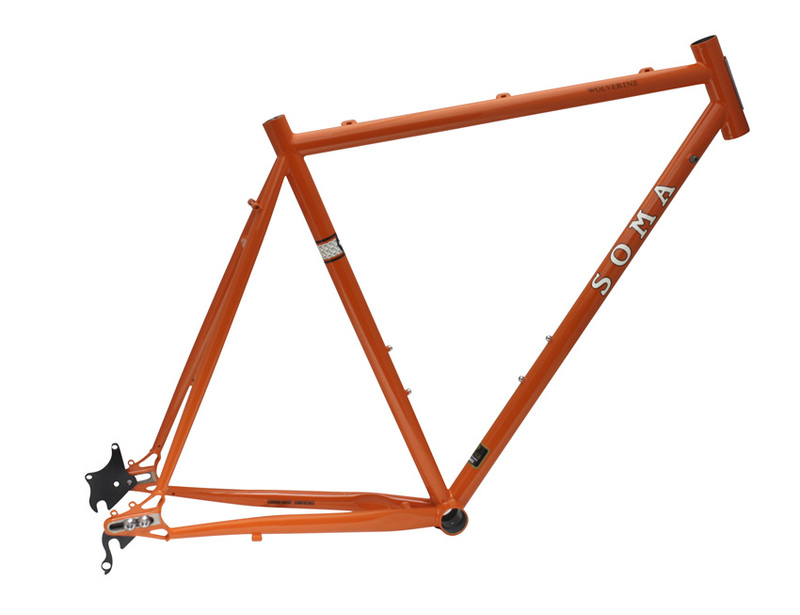 Pros: Steel frame/fork, touring crankset, wide gear range, barend shifters, mounting provision for everything that you need. Cons: It’d be nice if the Saga Disc complete bike was available. 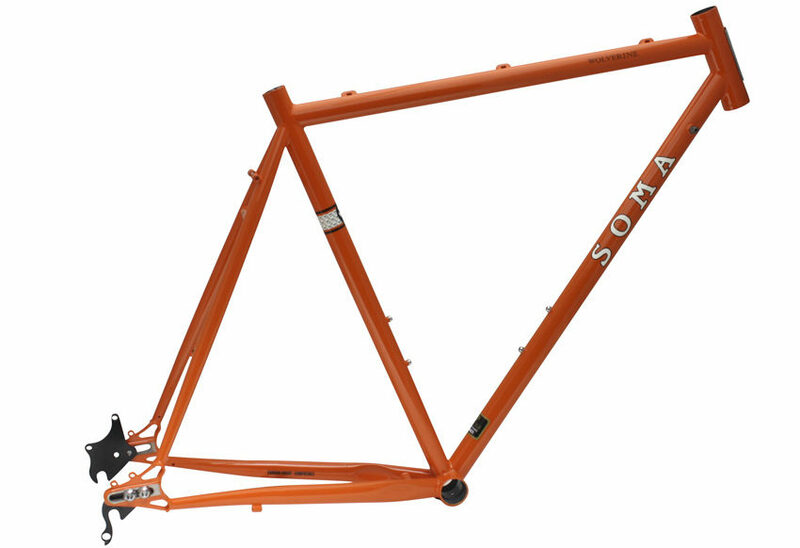 Pros: Steel frame/fork, belt drive compatible, sliding dropouts, Rohloff compatible. 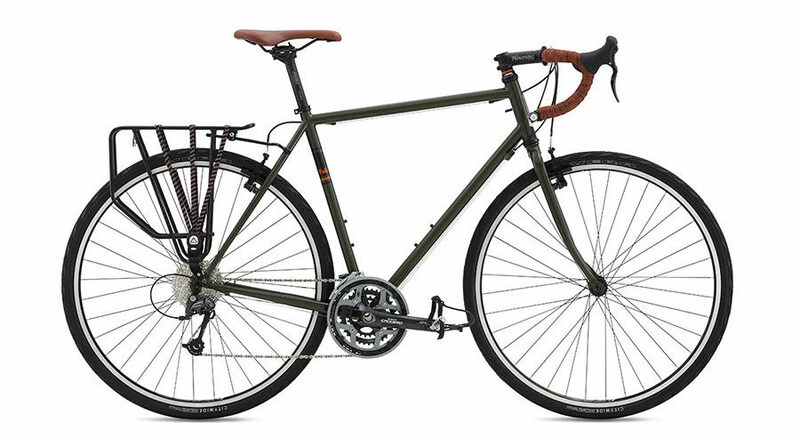 Cons: Short chainstays and headtube given it’s not a dedicated tourer. Pros: Geometry is perfect (in our opinion) for long haul touring, 26″ and 700c wheel size depending on rider height, steel frame/fork, 3x bidon mounts, Shimano XT derailleur and hubs, barend shifters, eyeleted 36h double-wall rims, wide gear range. Cons: No kickstand plate behind BB, cantilever brakes are average at best (LHT). Read my review HERE. 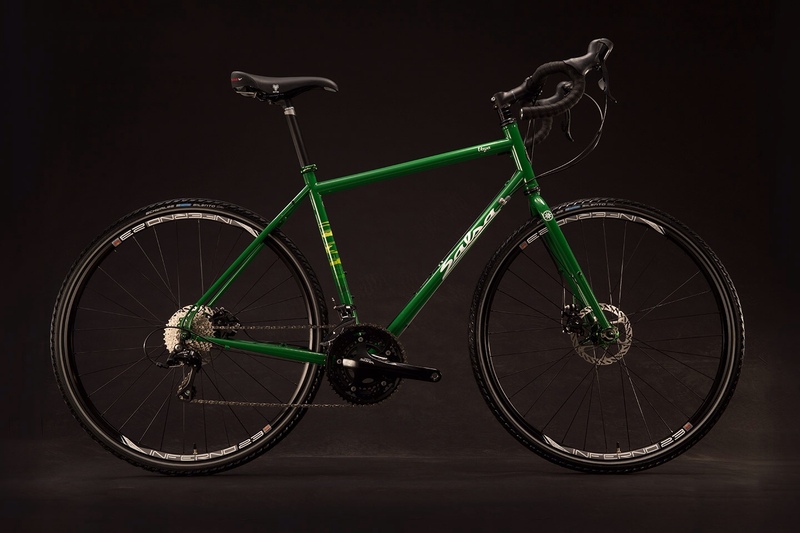 German manufacturer Tout Terrain put together some fantastic steel touring bikes with all the right parts. A Rohloff 14s hub provides maintenance-free gear shifting and the Carbon belt drivetrain will reduce the need to lube anything (and will run completely silent for 20000km+!). 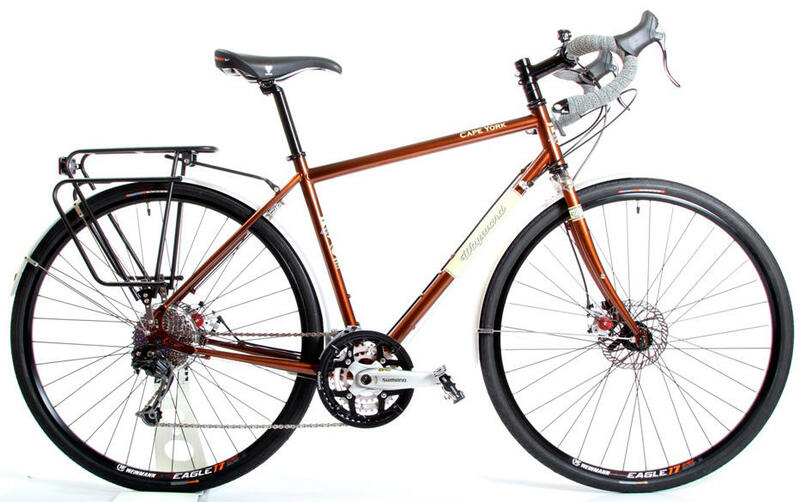 Added features include fenders, a built-in rack, a Brooks saddle, a Supernova dynamo hub and lights and The Plug III USB charger. This is actually quite a good value option when you consider what it comes with. 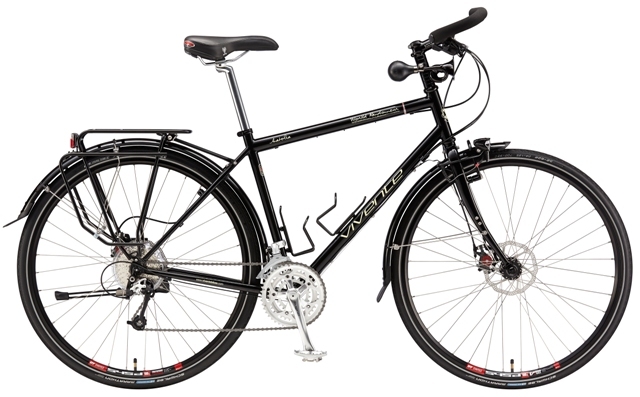 Vivente is another Australian brand making touring bikes. The owner of this business, Neil, tours a lot – he’s able to design the bikes to the way he likes. 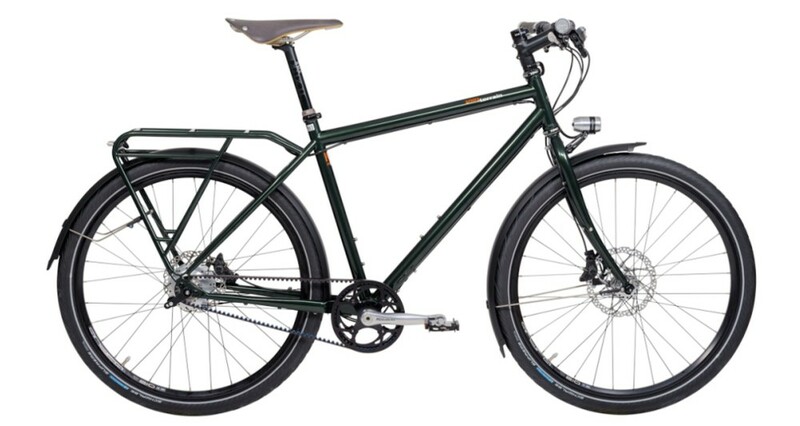 You can get your steel Vivente with drop bars or flat handlebars, with barend or STI shifters and with derailleurs or a Rohloff 14s internally geared hub. 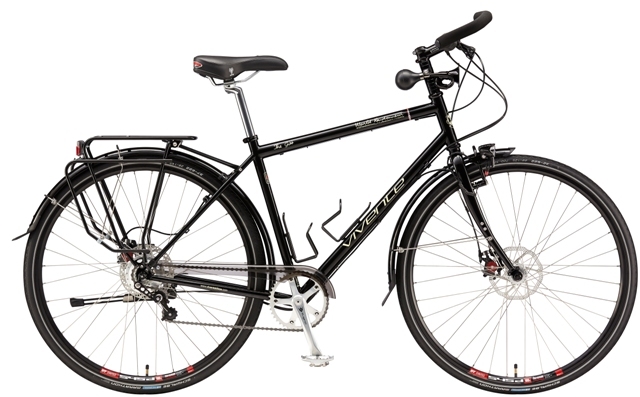 All the Vivente touring bikes come fully featured with dynamo hubs and lights, rear Tubus racks, fenders, a kickstand and a horn. A third Australian touring bike company! 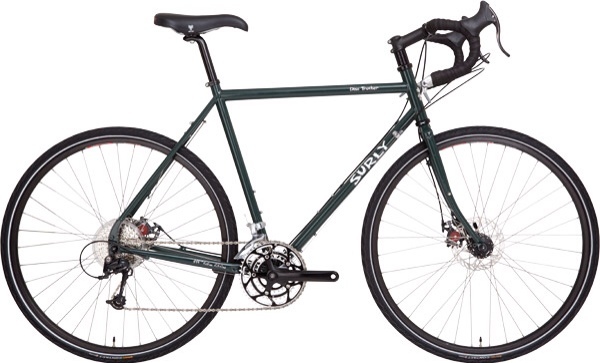 The Wayward touring bikes are both steel, the key difference in terms of components is the choice between rim and disc brakes. Like most good touring bikes, the Waywards use barend shifters and have a great climbing gear of 26-34t. 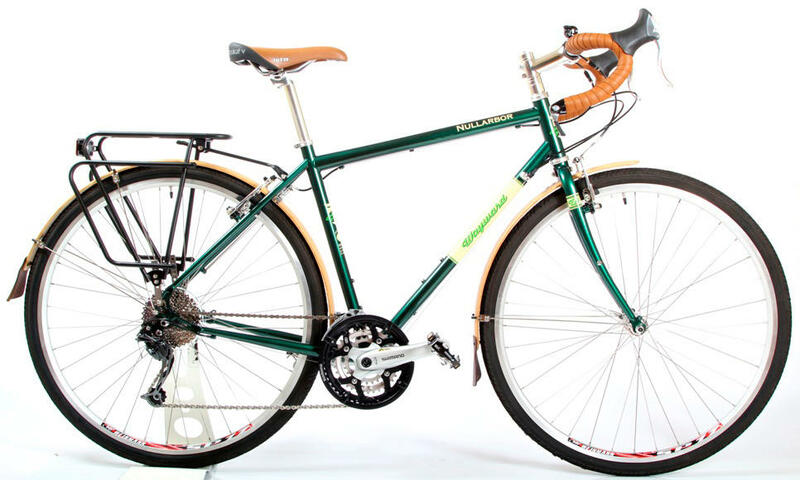 The fenders and racks complete the rather affordable package. The only thing to note is the rather obscure Shimano Octolink bottom bracket type – it may be hard to get spare parts for in the future.